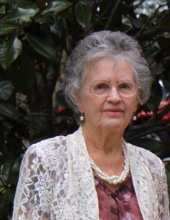 Verna Lee (Bond) Smith, age 85, of Lumberton passed away on March 31, 2019 in Lumberton, MS at home with her family. Verna was born January 8th, 1934 in Perry County, MS to the late Scott and Carrie McDonald Bond. Verna spent her years as a loving wife, mother, and grandmother. She loved her family dearly, as she always took great care of them. She cherished her role as a mother and grandmother and gave love and time without limit. She enjoyed visits from her sisters and brother, as well as her church family, who she loved. She held her relationships with family and friends most dear to her heart. She enjoyed the outdoors, keeping up her yard and birdwatching. She will always be remembered for her cheerful spirit and kind heart. Verna is preceded in death by her husband Estus Eugene Smith, her father Scott Bond, her mother Carrie McDonald Bond, her sisters Anna Lois Sanford, Lucille Candace York, and Scottlene Manual. She is survived by her sons Hank Smith (Lisa Davis Smith) of Lumberton and Tab Pittman (Tabitha Pittman) of Wiggins, her daughter Vicki Ladner of Vancleave, granddaughters Amanda Smith Baker (Caleb Baker) and Braylee, Kayla Pittman, Anastasia Ladner, and Jada Pittman, and grandsons Dustin Smith, TJoe Pittman (Katie Pittman), Grady Crosslin, Landon Meadows, and several great grandchildren. A visitation will be held from 5:00pm to 9:00pm Tuesday, April 2, 2019 at Red Hill Baptist Church in Lumberton. Services will be at 10:00am Wednesday, April 3, 2019 at Red Hill Baptist Church-113 Red Hill Church Rd. Lumberton, MS 39455. Interment will follow at Red Hill Baptist Church Cemetery. Moore Funeral Service in Wiggins, MS will be handling these arrangements. To send flowers or a remembrance gift to the family of Verna Lee Smith, please visit our Tribute Store. "Email Address" would like to share the life celebration of Verna Lee Smith. Click on the "link" to go to share a favorite memory or leave a condolence message for the family.